Part 1: This post is part of a series of posts showing what you’re accomplishing at a school in Baghdad. Lives are being changed, jobs created, and a community transformed. The only people who choose to move into an old school filled with a mountain of garbage and scrap metal are people with no other choice. When our partners in Baghdad first visited the school to meet with internally displaced (IDP) families living on the second floor, the first floor was so full of broken desks and equipment that it was uninhabitable. Or so they thought. Until their next visit, when they found nineteen families living amongst the trash. When you’ve had to flee violence with little warning in order to stay alive, you’re often left with few options. As unlikely as it seems, Baghdad has become a refuge for more than 150,000 people needing to escape the violence of the group known as ISIS. Many who fled their homes during the summer months found temporary shelter in schools empty for summer vacation. But as summer turned to fall, the schools were needed for classes for neighbourhood children. IDP families were told to leave. There are so many layers of anxiety that come with being displaced. First come waves of shock and fear; then anger. Grief comes later, with each daily reminder of all that has been lost. Eventually there comes a patch of calm, when shelter has been found. Life starts to have routine again: finding food, making meals, getting some rest at night. Then you’re asked to move. Again. In a city like Baghdad, whose resources have already been stretched paper thin in response to long-standing daily violence. 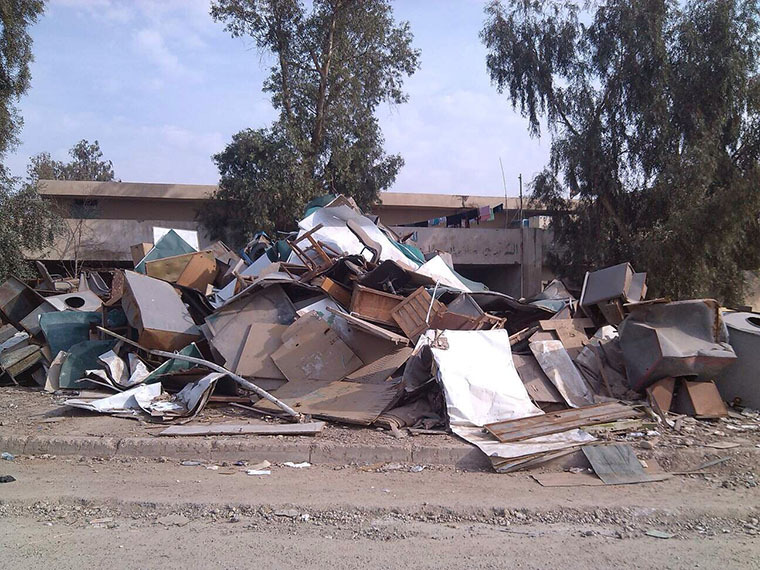 Desperate for shelter, the old, cold classrooms of Saqr Quraish School–heaped with garbage and slated for demolition–seemed like a reasonable option. Our partners in Baghdad are working hard with those who live in the school to make it a real home. They moved the tons of garbage out, cleaned the space, and fixed floors. They replaced missing doors and windows, installed functional bathrooms and electrical wiring. Each family has heaters and blankets, so the newborns and children can be protected from the cold. The residents have done much of the heavy lifting themselves, directly investing in their new community, and their new home. Your donations give these families a little breathing room. Your donations give them a place to live, to heal, and to make plans for the future. Your donations are turning the most unimaginable option into home. We will post updates over the next few weeks, so you can see the tangible difference being made in the lives of families who need it. Few are willing to invest into places like this; into people like this. Thank you.